1. First ever quilt. This teeny thing (i.e. too small to be of any use at all) was made in 2001, back when the only teach-yourself-to-quilt resources were depressingly old-fashioned books from the library. On the plus side, the piecing is pretty good (those logs finish at 3/4″) and it’s hand quilted. On the negative side, the polyester batting makes me want to cry. The kids love it though (in a that-was-the-first-blanket-you-made-me kind of way), so it can’t be all bad. 2. 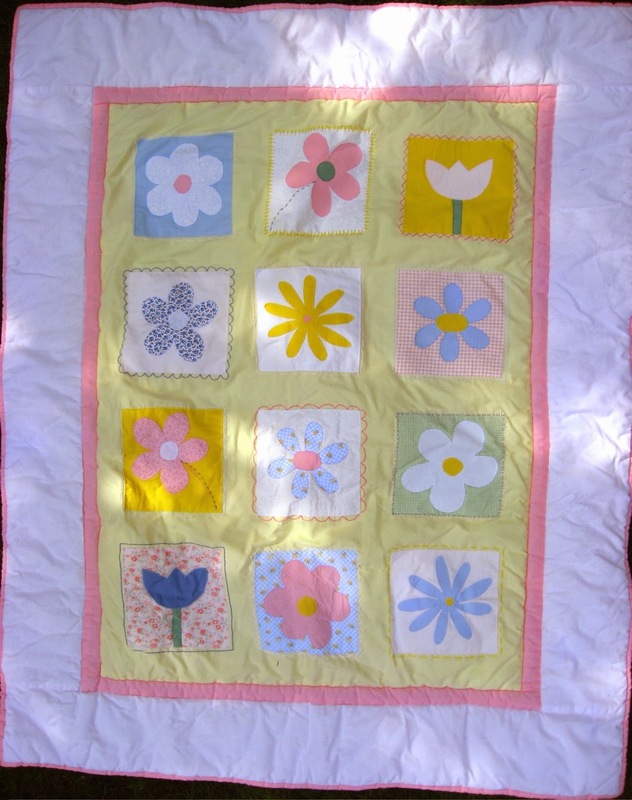 First applique quilt, 2002. God help me. This is the only photo I have – the actual quilt went to charity a long time ago. Again with the super puffy polyester batting. 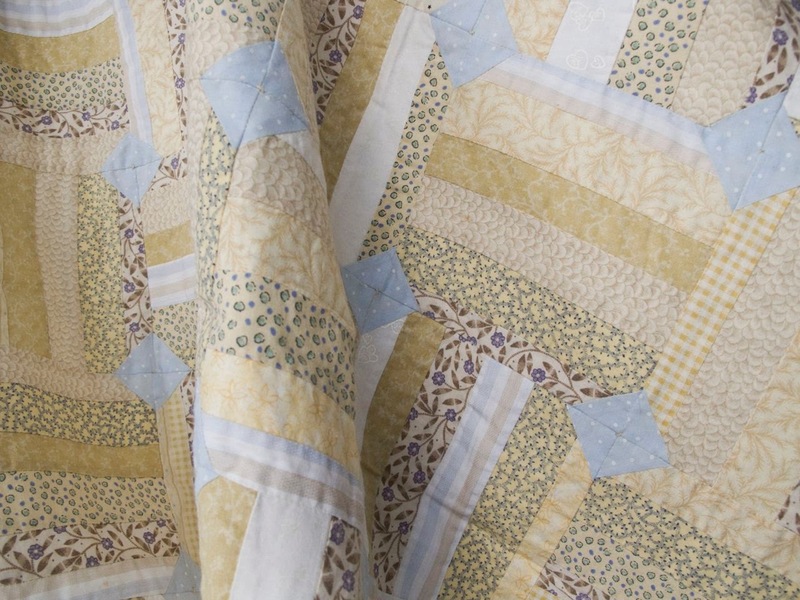 One positive thing – this was the first quilt I made to my own design (even if that design turned out to be, ahem, less than what I had envisaged). 3. 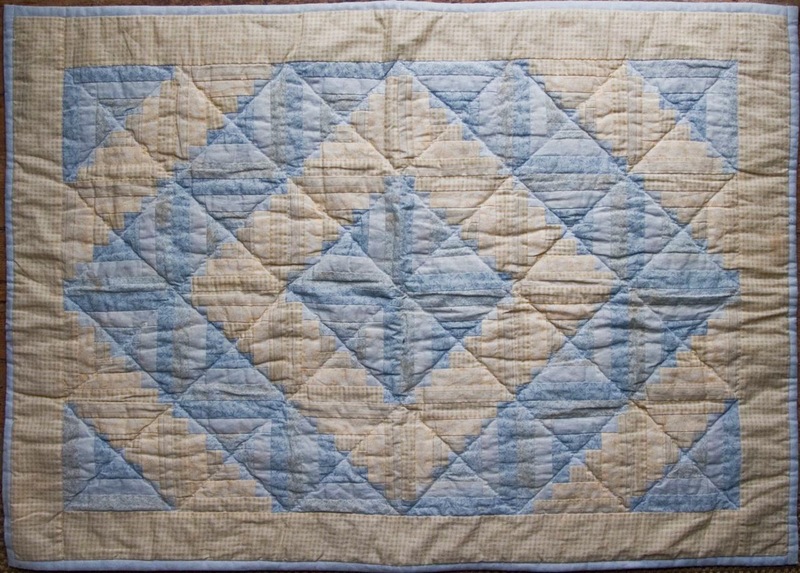 Ugliest quilt in the world, 2002 – never (no longer in my possession). OhmygodIcan’teven. Thinking about it, this might be where my dislike of scrappy comes from. I didn’t take a photo of it before I chucked it, which is kind of a shame but believe me you should be grateful. It was a crazy patchwork nightmare made in all sorts of alarming pastels (left over from the applique quilt above). The one thing it had going for it was that I didn’t use polyester batting. Unfortunately I used a nasty blanket instead. Sigh. 4. 2003 – 2005: an assortment of forgotten things. 5. The first quilt I was actually quite pleased with, 2006 (just don’t look too closely at the badly matched seams). A strippy snowball with actual cotton batting. It’s sized for a toddler bed, but never really got used because said toddler went straight into a big-boy bed. Pity. 6. A series of single bed quilts (one for each child), 2007. Daniel’s (the starry one) is still in use, but the others have been replaced with slightly more grown-up alternatives. I love these quilts. They bring back so many memories of when the girls were little. They mean cosiness and love and comfort to me. It’s hard to see how making these quilts has led me to where I am now, aesthetically. I no longer (except occasionally) make quilts for beds. I make them for walls, for display. Sometimes one will happen to be big enough that it gets a bit of couch use (like the scrappy tripalong, and Sunrise), but that is definitely the exception not the rule. I think my early quilts helped me to overcome my fear of “getting it wrong” – after all, quilting is just cutting bits of fabric up and sewing them back together. I rarely follow a pattern now (unless I’m making a monster). These quilts gave me a knowledge of boring but essential stuff like construction and quilt maths, with the added bonus of fulfilling their traditional purpose – keeping people warm. Now I’ve moved on to less traditional purposes. I like it here.